Journals generally avoid acting on data manipulation, unless forced to by investigations from universities and research institutions. The Lancet‘s current stance on Macchiarini (and previously Wakefield) affair is probably the most dangerous example. Practically at every single research integrity conference (which are usually organised by major publishers like Elsevier), publishing executives preach that journals should never be asked to deal with data manipulations in papers they publish, but only respond to the final results of institutional investigations. Actually, even there journals prefer not to retract as requested, as Science did in the case of Olivier Voinnet. On the other hand, some publishers are ready to forgive all misconduct when a unrepentant cheater offers them a new hot paper. Nature Publishing group, EMBO Press and even the publisher lobby group COPE recently protested against journals’ cheater blacklists, in connection with the data-faking plant researcher Patrice Dunoyer, a past Voinnet associate (his story here). And some journals even openly take the side of cheater scientists, while attacking PubPeer whistleblowers, as F1000 Research seemingly did, see tweet below. The following article lists Weizmann scientists with some serious evidence on PubPeer against the trustworthiness of their research. Before this elite institution from Rehovot, that most famous biomedical research centre in Israel, dismisses my article as anti-Semitic slander of an obscure German Nazi blogger, they should first try it with declaring me an assimilation-corrupted, self-hating diaspora Jew. Weizmann’ secret of success: they hardly ever investigate anyone, which by definition makes their scientists innocent and above all suspicion. The only guilty party who did face a Weizmann investigation was Rony Seger. And I found out what came first, the misconduct investigation with its disciplinary punishment, or the mass retractions of his paper at Journal of Biological Chemistry (JBC). It does look like Seger’s mistake was to publish in a journal which cares for research integrity more than others do. Some Weizmann peers of Seger’s were smarter, and went for Cell Press, who made their tolerance for misconduct an official policy (read here). Where no investigation takes place, there no misconduct can be found. And where nothing wrong is found, there can be no retractions. It is a dirty deal which suits everyone: research institutions concerned about their funding and reputation, journals keen to avoid work and responsibility (or just afraid of being sued), and of course this deal perfectly serves the cheater scientists. Unless a rogue journal editor decides to do the bad, evil, naughty thing and retract a paper on the clear evidence of data manipulation, without asking the university for permission. As it indeed happened, and left the fancy Weizmann Institute looking very silly. “We have not been contacted by the Weizmann Institute regarding Dr. Seger”. “We also understand that from time to time, and in outstanding case, when the public interest requires it, there might be a need to inform the campus about specific allegations as well as the result of the follow up investigations. At the same time, we also believe that there is no need of public naming and shaming. It is within this frame of mind that we report that lately, we had to deal with a case of serious misconduct that included manipulation of data. The resulting investigation led the management to take several disciplinary measure concerning the scientist, including not allowing him to mentor and advise future graduate students anymore and instructions to retract or correct all manipulated publications. We hope that the transparency will increase the awareness to the significance the Weizmann Institute holds for correct scientific conduct”. “Due to inadvertent errors in transferring images from Photoshop to Illustrator, there are five mistakes in four figures. We apologize for these mistakes and provide corrections below. The conclusions of the study remain unchanged by these corrections”. “Prof. Rony Seger’s research is supported by the Willner Family Center for Vascular Biology, which he heads; the Maurice and Vivienne Wohl Biology Endowment; the Judy and Monroe Milstein Fund for Ovarian Cancer Research; the Leah and Jack Susskind Foundation; Katy and Gary Leff, Calabasas, CA; Dr. and Mrs. Bernard E. Small, Montauk, NY; Gerhard and Hannah Bacharach, Fort Lee, NJ; Mario Fleck, Brazil; the estate of Leon Weiss; the estate of Lydia Hershkovich; and the state of John Hunter. Prof. Seger is the incumbent Yale S. Lewine & Ella Miller Lewine Professorial Chair for Cancer Research”. The stem cell scientist Hanna showed how never being investigated can revive a questionable career others already deemed in tatters. 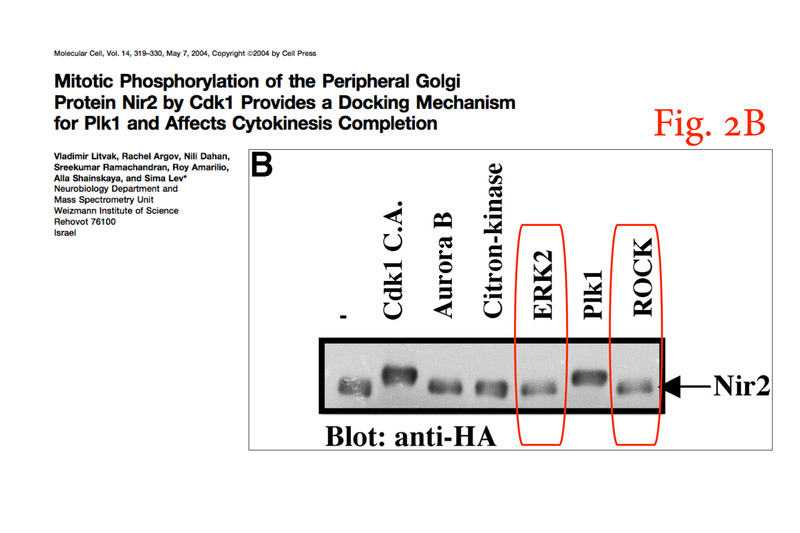 Hanna has an impressive PubPeer record, he retracted one paper (Hanna et al, 2004) and corrected 10 more. 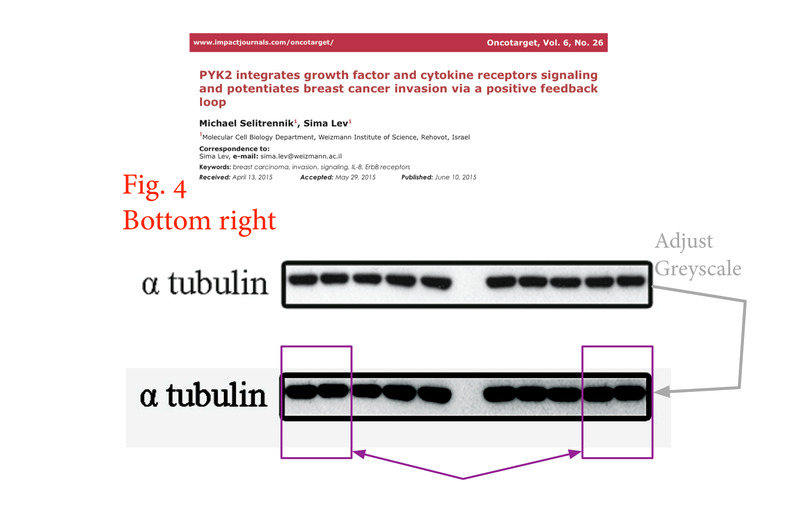 The stem cell researcher also engaged in anonymous PubPeer trolling of his former colleague (see my article here) and an all-out public brawl of misconduct accusations against his former US mentor Rudolph Jänisch at Whitehead Institute at MIT. Despite everything, Hanna was never investigated, neither by the Whitehead Institute, nor Weizmann. The elite European research funder ERC declared to me that Hanna’s problems with data integrity were all in the past, and not only they did not touch his ERC grant of €2 Million, they gave him another one as follow-up in December 2016 (read here). On top, Hanna was given this summer a fresh new grant from Israel Cancer Research Fund (ICRF). An expected full professorship for Hanna at Weizmann is a mere formality now. To make it clear to everyone how European science peers see Hanna and his way to do research, he was appointed EMBO member in June 2017. 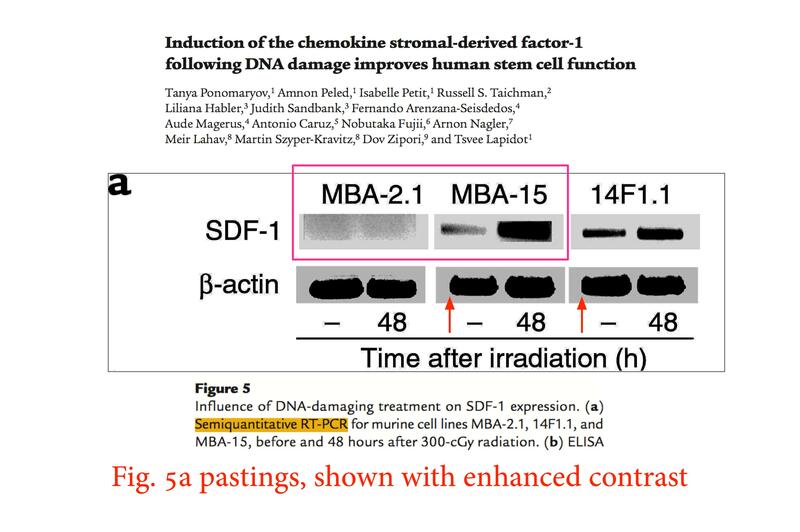 Being EMBO member apparently grants every dishonest European researcher immunity from any serious institutional investigations, or in fact retractions (see examples here and here). The scientific world can now look forward to continue trying to reproduce the cell reprogramming work which Hanna and his Weizmann lab feed into top level journals. More PubPeer debates about how to make head or tail of Hanna’s impact-factor-strong discoveries is to be expected. Weizmann Institute previously refused all communication with me about their stem cell researcher, or anyone else for that matter. “Dr. Jacob Hanna’s research is supported by Pascal and Ilana Mantoux, France/Israel; the Benoziyo Endowment Fund for the Advancement of Science; the Leona M. and Harry B. Helmsley Charitable Trust; the Sir Charles Clore Research Prize; Erica A. Drake and Robert Drake; the European Research Council; and the Fritz Thyssen Stiftung”. The Weizmann lab of the microbiologist Kolodkin-Gal studies the mechanisms of bacterial biofilm assembly and disassembly, which potentially has tremendous implications in health care, especially given the dangers of multi-drug-resistant bacterial strains. One wonders however how reliable her research is, given the errors she had to retract and correct, and the fact that other groups have disproved her key research findings. “In this article, we reported that norspermidine is produced in aged biofilm cultures of Bacillus subtilis and that norspermidine could disassemble and inhibit B. subtilis biofilms. Both claims have been challenged by Hobley et al. (2014, Cell 156, 844–854). We have subsequently repeated the experiments and have found that the new results can no longer support our original conclusions. Therefore, the most appropriate course of action is to retract the article. We offer our apologies for these errors and for any inconvenience that they may have caused”. In 2013, the Losick group published results showing that D-amino acids inhibited bacterial growth and the expression of biofilm matrix genes and that the strain they originally used to study biofilm formation (B. subtilis) has a mutation in the D-tyrosyl-tRNA deacylase gene, an enzyme that prevents the misincorporation of D-amino acids into protein (Leiman et al., 2013). In a B. subtilis strain, which has a working copy of this gene, D–amino acids did not inhibit biofilm formation. The conclusion from their study was that “the susceptibility of B. subtilis to the biofilm-inhibitory effects of D-amino acids is largely, if not entirely, due to their toxic effects on protein synthesis. Does that mean that they no longer see D-amino acids as a specific mechanism to disassemble biofilms in B. subtilis but rather as nonspecific inhibitors of growth in some genetic backgrounds? Leiman et al. (2013) make no comment on the ability of D-amino acids to inhibit biofilm formation in staphylococcus aureus and Pseudomonas aeruginosa, as claimed in this article. The whole concept of biofilm dissasembly by D-amino acids therefore appears confusing. It was recently published an article showing that D-amino acids do not inhibit biofilm formation in Staphylococcus aureus (Sarkar S and Pires MM, 2015)”. Kolodkin-Gal, speaking at an conference in 2015, organised by predatory publisher and conference seller OMICS. Photo: OMICS. 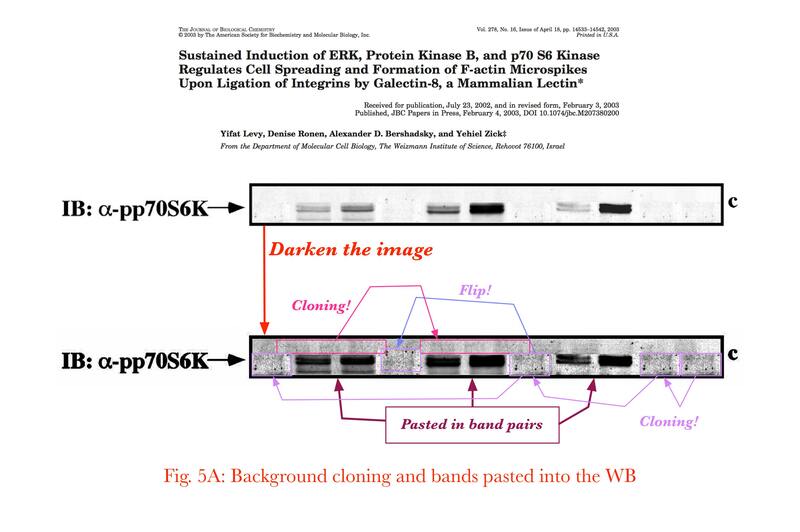 PubPeer-listed evidence of western blot panel duplication and even duplication of individual western blot bands, in Kolodkin-Gal et al, PLOS Biology, 2008. “Ilana Kolodkin Gal’s research is supported by the Benoziyo Fund for the Advancement of Science; the Abramson Family Center for Young Scientists; the Leo and Julia Forchheimer Center for Molecular Genetics; the Adelis Foundation; the Abraham and Sonia Rochlin Foundation; the Angel Faivovich Foundation for Ecological Research; the Lord Sieff of Brimpton Memorial Fund; the Larson Charitable Foundation; Ayala Benjamin-Mashat, Switzerland; Lois Rosen, Los Angeles, CA; Dan and Susan Kane, Westlake Village, CA; the late Rudolfine Steindling; and the estate of Samuel and Alwyn J. Weber. Dr. Koldkin-Gal is the incumbent of the Rowland and Sylvia Schaefer Career Development Chair in Perpetuity”. 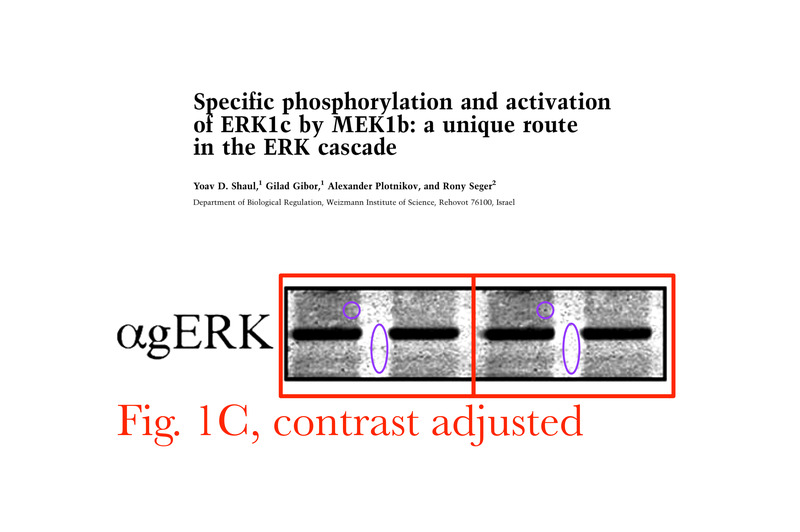 One paper from Gross lab has been corrected for a kind of underhand image duplication, Buzaglo-Azriel et al, Cell Reports 2016 (PubPeer evidence here). This being Cell Press, the correction notice is as usual well hidden from the article site, as not to confuse readers. 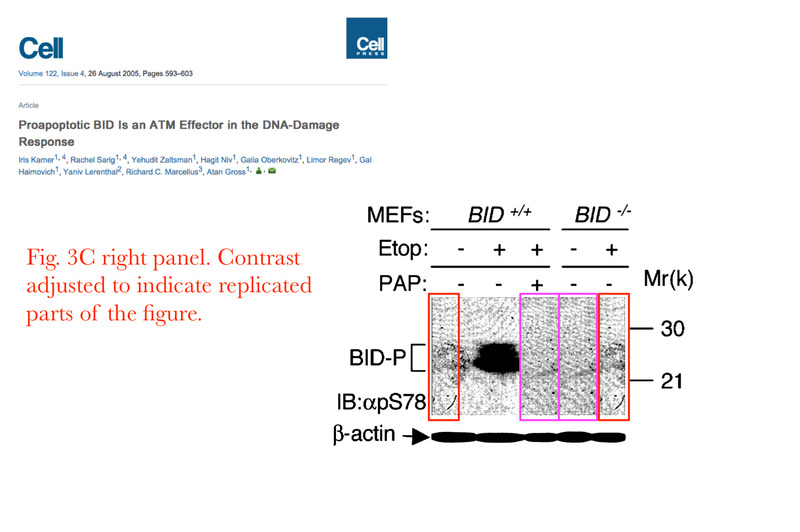 One can safely assume that Cell will do exactly nothing about this and other PubPeer-listed problems with the older paper Kamer et al, Cell 2005. Good for Gross! “Prof. Atan Gross’s research is supported by the Yeda-Sela Center for Basic Research; the Adelis Foundation; the Pearl Welinsky Merlo Foundation Scientific Progress Research Fund; the Hymen T. Milgrom Trust Donation Fund; the Rising Tide Foundation; and the estate of Tony Bieber. Prof. Gross is the incumbent of the Marketa and Frederick Alexander Professorial Chair”. Lev is cancer researcher, her Weizmann lab works on cell signalling in cancer and metastasis. 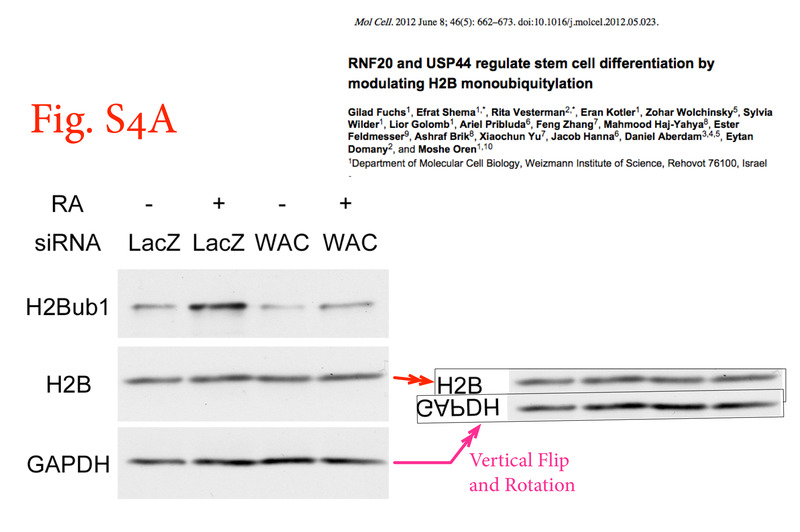 Which means a lot of western blotting, and there PubPeer sleuths found some very impressive gel duplications in papers from her Weizmann lab. 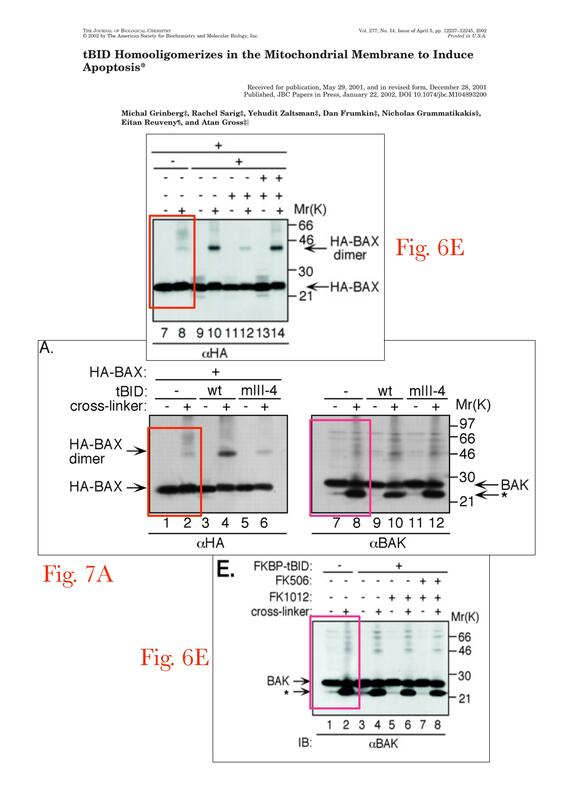 Below is an example from Litvak et al 2004, where according to this PubPeer thread, quite a number of select western blot bands seem mysteriously duplicated inside same gels. Good thing the journal Molecular Cell and the Cell Press CEO made it their official policy not to act upon such evidence. In such cases it is indeed best not to look, because if the gel band duplications are confirmed, no other explanation but wilful data manipulation and heavy research misconduct are possible. “Prof. Sima Lev’s research is supported by the Benoziyo Fund for the Advancement of Science; the Miriam and Luis Stillmann Laboratory; the Dr. Dvora and Haim Teitelbaum Endowment Fund; the Steven B. Rubenstein Research Fund for Leukemia and Other Blood Disorders; Foundation Adelis; the Rising Tide Foundation; Lord David Alliance, CBE; and David E. and Sheri Stone, Coral Gables, FL. Prof. Lev is the incumbent of the Joyce and Ben B. Eisenberg Professorial Chair of Molecular Endocrinology and Cancer Research”. 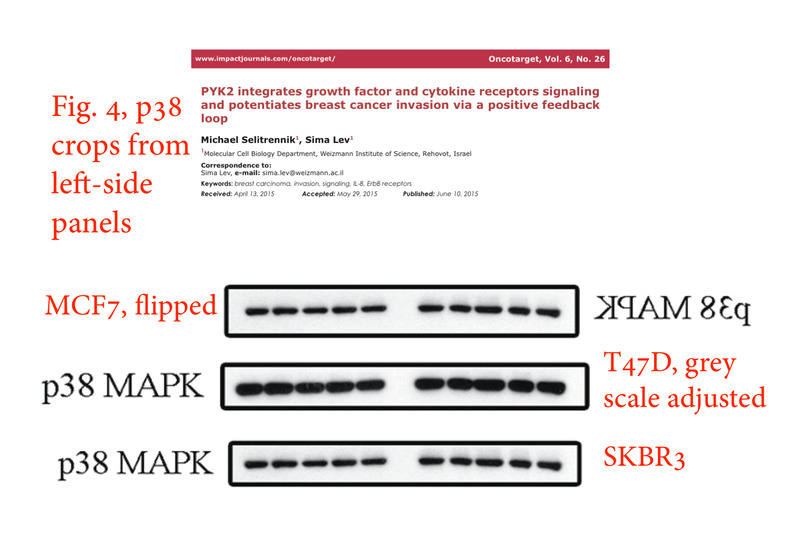 PubPeer evidence. Top: both upper FACS panels look too similar to be different measurements, except of some additional dots. Middle: gel bands appear boxed, which suggests digital copy-paste. Bottom: a gel lane seems digitally copy-pasted 4 times. “Indeed there are 4 lanes (one control, mouse DNA only, and 3 NOD/SCID mice bone marrow which is negative for human cells under the tested conditions) which look similar after scanning. The data is also supported by other assays. Whoever is interested to repeat our results, is welcome to contact us directly. Whatever all this gel cloning is about, it certainly warrants an investigation and likely literature corrections. But Weizmann did not bother in those apparently much worse cases, so why would they here? “Prof. Rivka Dikstein’s research is supported by the Pearl Welinsky Merlo Foundation Scientific Progress Research Fund; the Yeda-Sela Center for Basic Research; the Wolfson Family Charitable Trust; and the Y. Leon Benoziyo Institute for Molecular Medicine. Prof. Dikstein is the incumbent of the Ruth and Leonard Simon Professorial Chair of Cancer Research”. Alon lab at Weizmann studies immunology, specifically the leukocyte chemotaxis. Two of his lab’s papers were flagged on PubPeer. In one case, the collaborator Amos Simon admitted duplications, but declare those to be “unfortunate oversights must have been accidentally introduced into the final figure prepared for the manuscript” and not really important anyway, because the results were independently reproduced elsewhere. 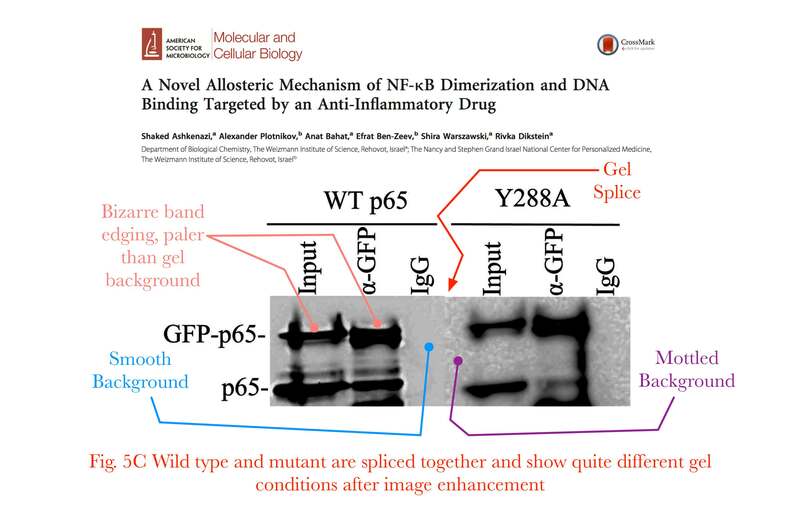 In another case of gel duplications (below), Alon attempted to clarify the mistake on PubPeer, and admitted in the process that his lab has no problem whatsoever with presenting the loading control bands from a separate gel as originating from that one which they are supposed to be controlling for. This “loading control stock” practice drives the concept of gel loading controls ad absurdum, but as I learned meanwhile, it is not that uncommon. “Prof. Ronen Alon’s research is supported by the M.D. Moross Institute for Cancer Research; Lord David Alliance, CBE; and Mr. and Mrs. William Glied, Canada. Prof. Alon is the incumbent of the Linda Jacobs Professorial Chair in Immune and Stem Cell Research”. In a PubPeer comment, Oren and Rotter announced to have notified the journal, like they did for some other of their publications flagged there. Indeed, another paper with same first author in same journal Cancer Research (Weisz et al 2007) was corrected in September 2015. Because the PubPeer-listed data manipulations (gel band excision, removal and copy-pasting in Photoshop-like software) could hardly be justified by an intentional oversight, the offending data was simply removed and replaced with freshly generated one. “In this article (Cancer Res 2007;67:2396–401), which appeared in the March 15, 2007, issue of Cancer Research (1), some lanes in the Western blots in Fig. 3 have been inappropriately manipulated. This does not affect in any way the article’s conclusions. The authors have performed new experiments under exactly the same conditions as in the original figures, using identical cellular and molecular reagents; the only exception was that for the repeat of the blot in Fig. 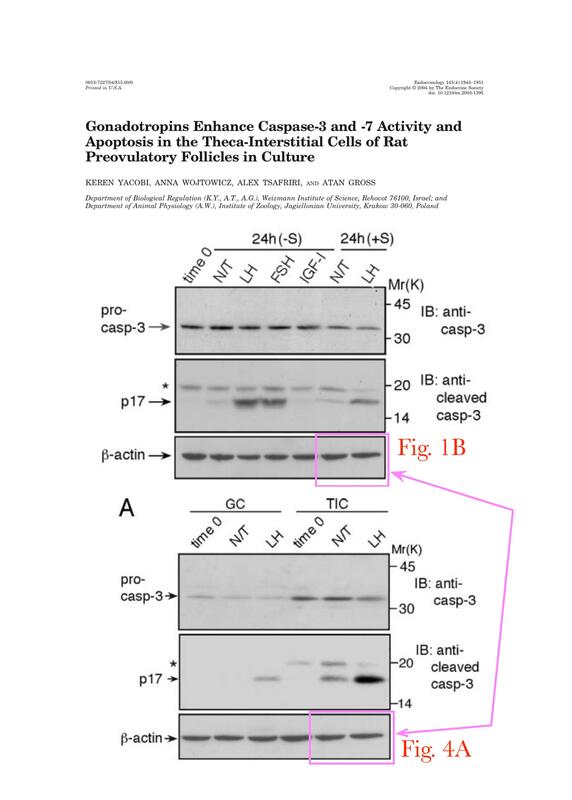 3C, GAPDH rather than vinculin was used as a loading control for the sake of uniformity. The results are fully consistent with those shown in the original figure. The authors thank Dr. Hilla Solomon for performing the new experiments. The new Western blots appear below. The authors regret these errors”. Rotter and Oren, in the 1970ies. Already back then some things were duplicated. Photo: Israel Cancer Research Fund. Thus, somehow 11 year old reagents were recovered and experimental analyses were exactly repeated. This time without data manipulations, yet exactly same results were obtained. A prophesy or a miracle of reproducibility indeed, but Weizmann is after all in the biblical land where such things used to happen regularly. Interestingly, the work was now done by a new contributor, previously utterly unrelated to the paper. Should Dr Salomon have retrospectively received a corrected co-authorship for her efforts? G-d knows. Despite their professional unity, Oren and Rotter also have their own, independent papers flagged on PubPeer. Rotter’s problems is gel lane splicing, a practice deemed inappropriate since at least around 10 years, and it certainly was never acceptable when splicing happened undeclared and hidden. 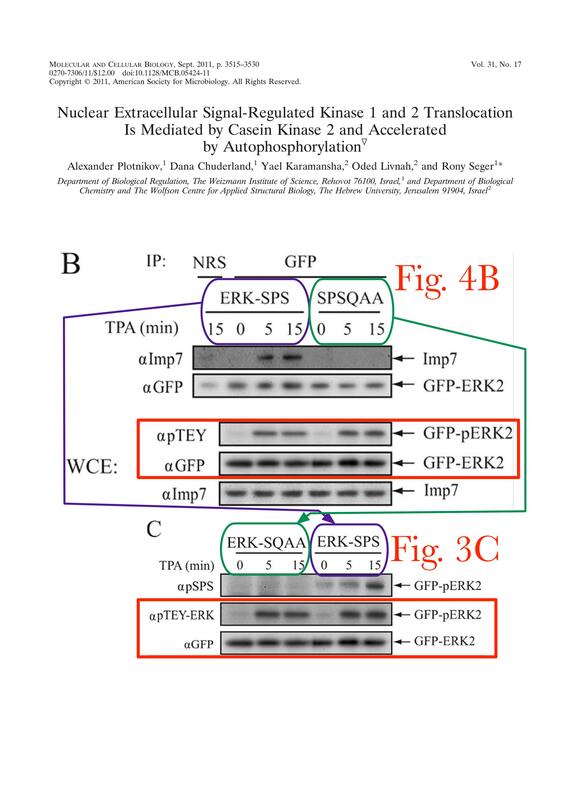 But not for Rotter, whose lab however did take care to mask the splicing inside the figures (see PubPeer thread for Molchadsky et al PLOS One 2016 as example). 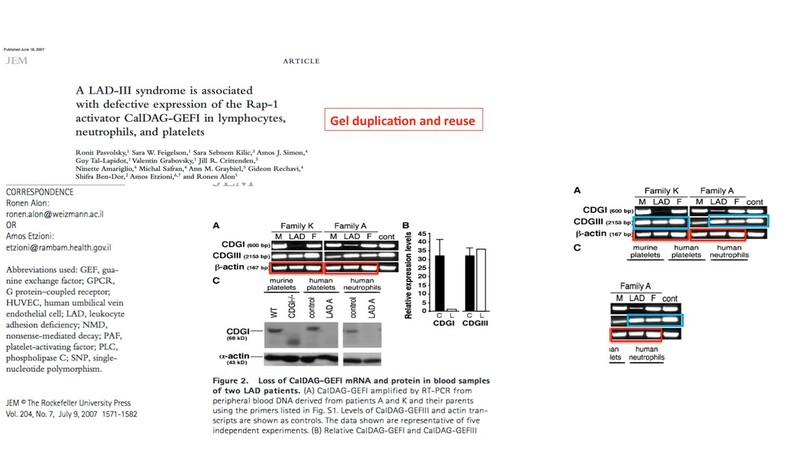 Oren announced on PubPeer to have contacted the journal (just as he and Rotter did for another twisted gel duplication in their paper Stambolsky et al 2010 in Cancer Cell here. But we already know how Cell Press reacts, or in fact does not react, to this. Good for all involved. “Prof. Moshe Oren’s research is supported by the Moross Integrated Cancer Center; the Pearl Welinsky Merlo Foundation Scientific Progress Research Fund; and the Dr. Miriam and Sheldon G. Adelson Medical Research Foundation. 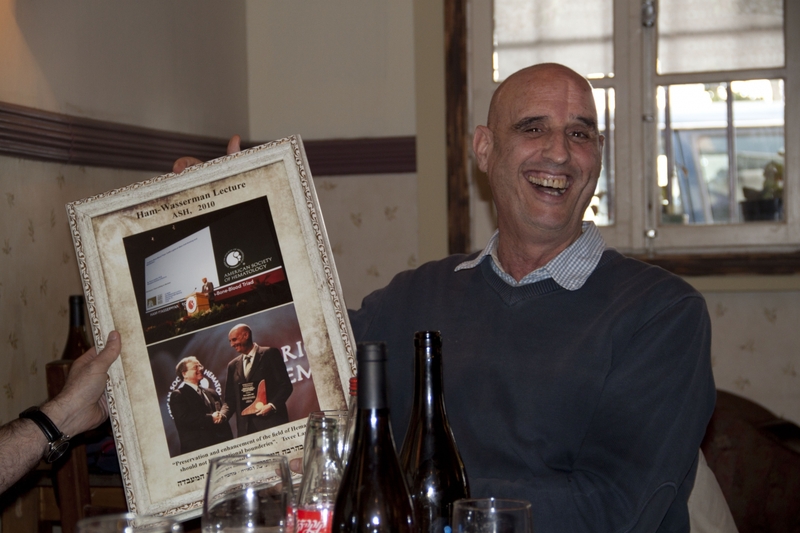 Prof. Oren is the incumbent of the Andre Lwoff Professorial Chair in Molecular Biology. Prof Varda Rotter’s research is supported by Philip Garoon, Chicago, IL; and the Leir Charitable Foundation. Prof. Rotter is the incumbent of the Norman and Helen Asher Professorial Chair of Cancer Research“. I have been enjoying this Pubpeer comment thread, which is a cross-over production — with two Weizmann authors (Tatiana Rozovskaia and Eli Canaani), but also Carlo Croce. Thus it is hard to know whom to credit for the Western blots, which are masterpieces of collage that Max Ernst would be proud of. Thank you for the overview of problematic issues in publications from the Weizmann institute. 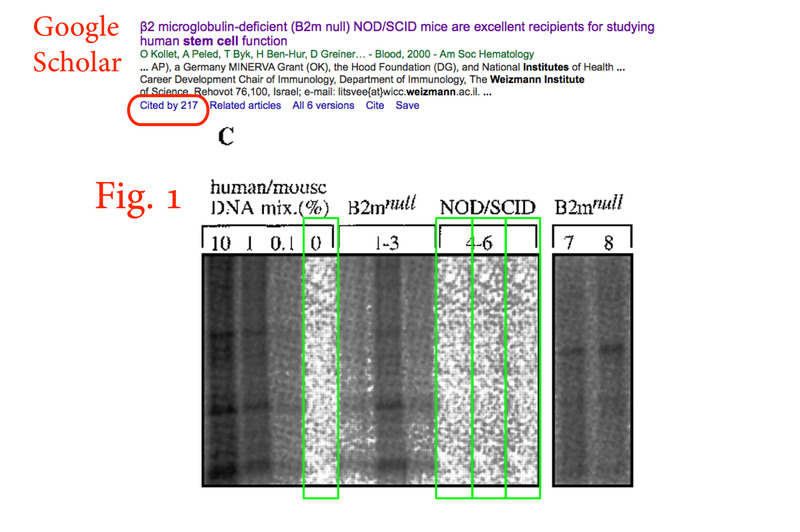 I have by several occasions observed what I can call very creative use of data in articles published from Weizmann. When contacting the Weizmann institute about these issues, I never got any response back. No I understand why. It is simply too much. So much junk has been accumulated from different scientists and trying to do something will initiate a domino effect destroying the whole institute. They can continue their building of a rat ship as long as the journals are not taking any action. I applause Journal of Biochemistry for their null tolerance for figure manipulation, and hope more journals can show some integrity and care for the science and not only counting their profit. Have they taught an entire generation of researchers that if experimental results do not illustrate your desired hypothesis then you simply fake them? Let’s start with a disclosure that I did my PhD in Weizmann Institute, so I may be biased. Nonetheless, my opinion is that scientific misconduct is everywhere, but famous and highly-cited labs automatically draw disproportional attention. Thus, the more prestigious the institute is, the more fire it gets. Data manipulation will be more likely to be detected. The same goes for internal policies dealing with scientific misconduct. What are your control experiments? Compare to other research institutes. 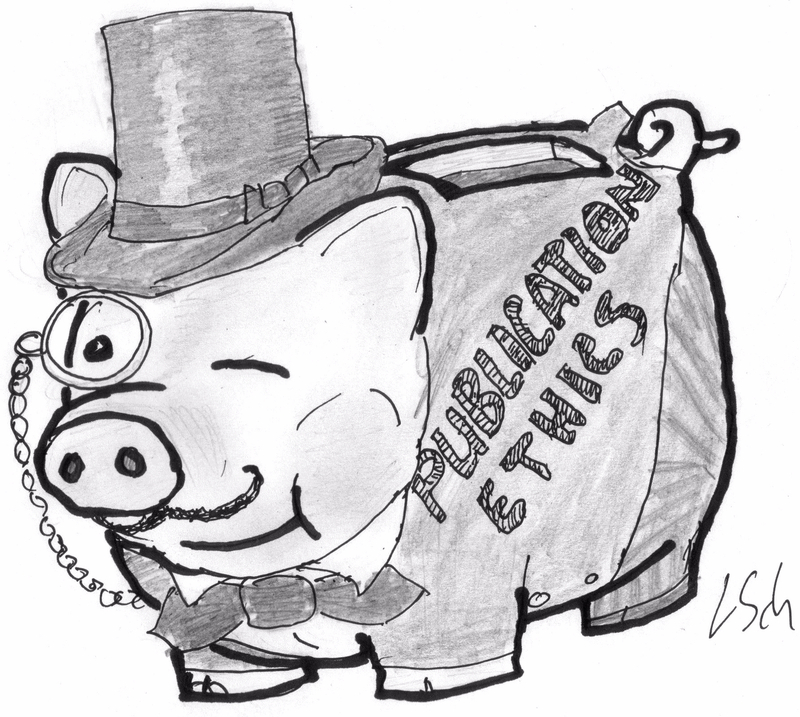 How do they act when they reveal scientific misconduct on their premises? My guess – usually nothing. How do they act when they are criticized? Prestigious institutes may use public affairs to deal with these things, while lower-tier institutes may not even bother. They cannot afford losing a “good” scientist. The lower-tier the institute is, the likelihood of being criticized is lower. Once it causes them troubles, then they must deal with these incidents in order not to lose reputation (e,g, Seger case or even the STAP stem cells which is the most extreme case). To summarize, academic culture may be ethically flawed, but Weizmann Institute is not that unique. Grouping these scientists in one post, I feel, serves no purpose, except for defaming one institute that is not worse than others. Thank you for informing us that according to your opinion there is nothing unusual or even worth to note in multiple not investigated fraud cases by Weizmann Institute while you think that in other Institutes things are likely much worse. However, my opinion is that “highly cited” Institutions must provide best possible example of research integrity and make all possible efforts to investigate very clear evidence of fraud. Of course, if they want to be not only “well cited” or “famous” but also well reputed. Data fabrication may occur regularly, but it is not everywhere, I can assure you. There are many, many labs where the quality of the evidence, signal-to-noise and the importance of understanding experimental noise is at the heart of PhD training by the supervisor. So it is also true that may departments do not engage misconduct, it is a matter of culture and leadership. Even when leadership is absent through a poor appointment, the ingrained culture ensures quality at least for a while. I suspect one common theme is funding. Misconduct is likely more common in very large labs where the PI has very little input into data collection, so labs managed by powerpoint where the PI sees the output of each student and postdoc no more than monthly and probably less. From here, it is a small step to pushing the young scientists in training to manipulate to get the ‘desired’ result. Much has been written about the reward system pushing fraudulent science. I would add that funding systems are conservative and generally incremental, regardless of the trumpeting of ‘novelty’ by journals. Incremental science has a reasonably predictable outcome, hence the common defence that others have replicated the “result”. ubiquitous. However, the Weizmann Institute is pretty unique by not responding when contacting them regarding apparently misconduct. I think media and people like Leonid serve a very important mission by adressing these problems and I don’t see any problems in showing an overview of the problematic issues. The list is long, emberrasing and the cases are apparently pretty nasty. The time is overdue to clean up the mess. I presume then Bernd Pulverer is not and has never been representative of EMBO Press? Mol Cell Biol. 2007 Mar;27(5):1889-903. Epub 2006 Dec 18. Knockdown of ALR (MLL2) reveals ALR target genes and leads to alterations in cell adhesion and growth. Issaeva I1, Zonis Y, Rozovskaia T, Orlovsky K, Croce CM, Nakamura T, Mazo A, Eisenbach L, Canaani E.
Some interesting reading and looking at pictures (the figures from the paper). Note that it is another Weizmann/Carlo Croce cross-over production. It is one article about the Weizmann Institute. There do seem to be problematic data in the publications noted by Leonid. “we know that misconduct occurs everywhere among the thousands of institutes in the world”. Israel is quite good at pop music and art, but not quite so good at the biological sciences. From the Weizmann lab of Yehiel Zick, who works on Insulin Resistance and Bone Remodeling. J Immunol. 2005 Jul 1;175(1):276-85. Heat shock protein 60 activates cytokine-associated negative regulator suppressor of cytokine signaling 3 in T cells: effects on signaling, chemotaxis, and inflammation. Zanin-Zhorov A1, Tal G, Shivtiel S, Cohen M, Lapidot T, Nussbaum G, Margalit R, Cohen IR, Lider O.
J Immunol. 2005 Jul 1;175(1):276-85 continued. J Immunol. 2005 Mar 15;174(6):3227-36. Heat shock protein 60 inhibits Th1-mediated hepatitis model via innate regulation of Th1/Th2 transcription factors and cytokines. Zanin-Zhorov A1, Bruck R, Tal G, Oren S, Aeed H, Hershkoviz R, Cohen IR, Lider O.
J Immunol. 2001 Jun 15;166(12):7121-7. Augmentation of RANTES-induced extracellular signal-regulated kinase mediated signaling and T cell adhesion by elastase-treated fibronectin. Brill A1, Hershkoviz R, Vaday GG, Chowers Y, Lider O.
J Immunol. 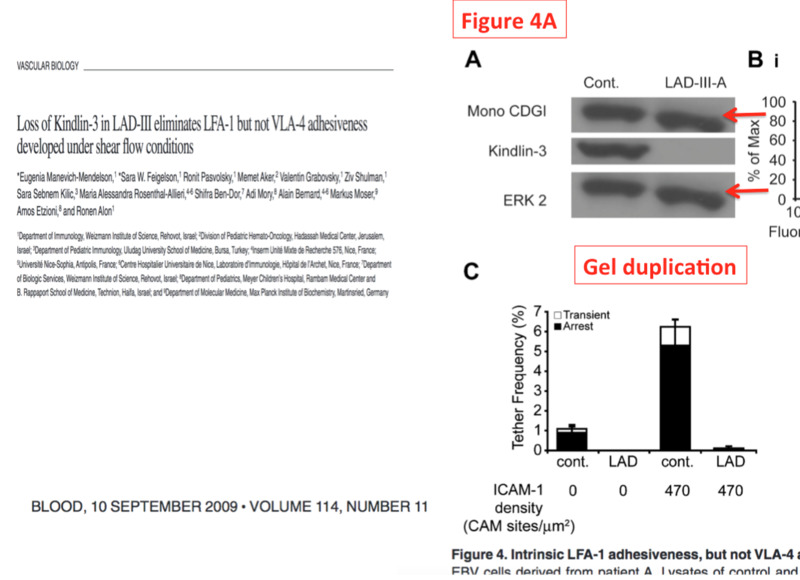 2005 Sep 1;175(5):3165-76.
Cooper A1, Tal G, Lider O, Shaul Y.
J Immunol. 2003 Dec 1;171(11):5882-9. Fibronectin-associated Fas ligand rapidly induces opposing and time-dependent effects on the activation and apoptosis of T cells. Zanin-Zhorov A1, Hershkoviz R, Hecht I, Cahalon L, Lider O.
J Clin Invest. 2006 Jul;116(7):2022-32. Epub 2006 Jun 8. Heat shock protein 60 enhances CD4+ CD25+ regulatory T cell function via innate TLR2 signaling. Zanin-Zhorov A1, Cahalon L, Tal G, Margalit R, Lider O, Cohen IR. Blood. 2008 Jan 1;111(1):50-9. Epub 2007 Sep 27. IL-15 regulates immature B-cell homing in an Ly49D-, IL-12 , and IL-18 dependent manner. Hart G1, Avin-Wittenberg T, Shachar I.
J Immunol. 2005 Oct 15;175(8):5034-42. Tight regulation of IFN-gamma transcription and secretion in immature and mature B cells by the inhibitory MHC class I receptor, Ly49G2. Hart G1, Flaishon L, Becker-Herman S, Shachar I. Blood. 2010 Dec 23;116(26):5907-18. doi: 10.1182/blood-2010-06-293506. Epub 2010 Oct 5. Talin1 is required for integrin-dependent B lymphocyte homing to lymph nodes and the bone marrow but not for follicular B-cell maturation in the spleen. Manevich-Mendelson E1, Grabovsky V, Feigelson SW, Cinamon G, Gore Y, Goverse G, Monkley SJ, Margalit R, Melamed D, Mebius RE, Critchley DR, Shachar I, Alon R.
The FASEB Journal express article 10.1096/fj.02-1139fje. Published online June 17, 2003. Blood. 2005 Apr 15;105(8):3087-93. Epub 2004 Dec 30. Redirected primary T cells harboring a chimeric receptor require costimulation for their antigen-specific activation. Friedmann-Morvinski D1, Bendavid A, Waks T, Schindler D, Eshhar Z. Department of Immunology, The Weizmann Institute of Science, Rehovot 76100, Israel. Mutant p53 gain of function: repression of CD95(Fas/APO-1) gene expression by tumor-associated p53 mutants. Zalcenstein A1, Stambolsky P, Weisz L, Müller M, Wallach D, Goncharov TM, Krammer PH, Rotter V, Oren M.
Department of Molecular Cell Biology, Weizmann Institute of Science, PO Box 26, Rehovot, 76100, Israel. J Biol Chem. 2004 Dec 3;279(49):50976-85. 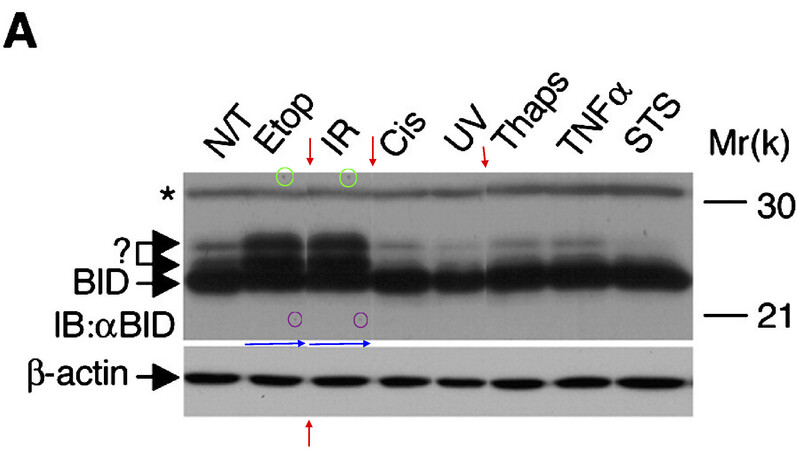 Epub 2004 Sep 15.
p53-dependent down-regulation of telomerase is mediated by p21waf1. Shats I1, Milyavsky M, Tang X, Stambolsky P, Erez N, Brosh R, Kogan I, Braunstein I, Tzukerman M, Ginsberg D, Rotter V.
Genes Dev. 2005 Feb 1;19(3):316-21. 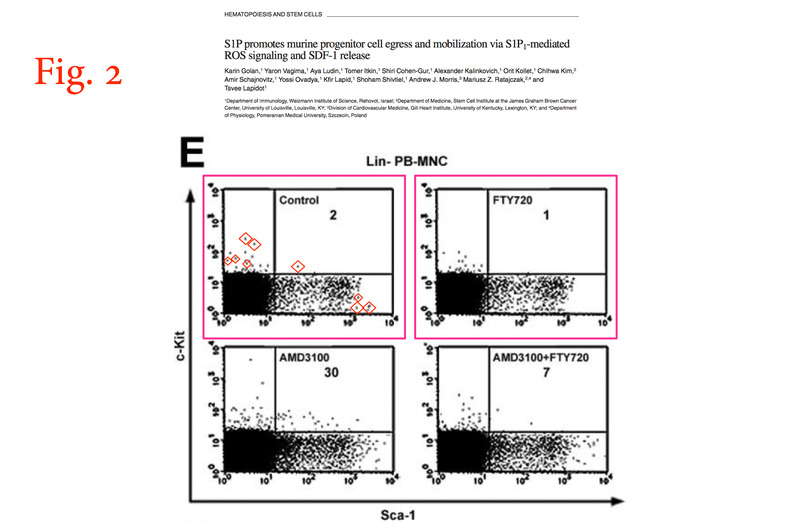 A mechanism of ubiquitin-independent proteasomal degradation of the tumor suppressors p53 and p73. Asher G1, Tsvetkov P, Kahana C, Shaul Y.
Mol Cell. 2005 Mar 4;17(5):645-55. 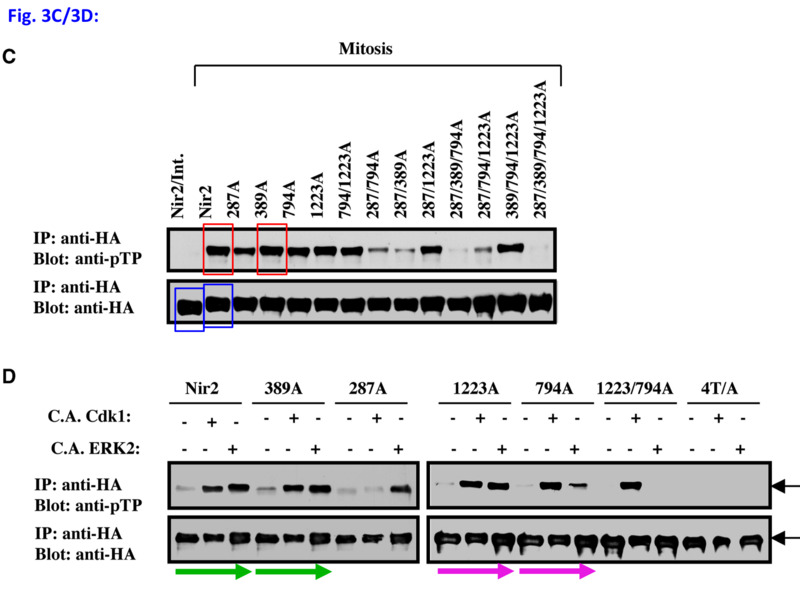 20S proteasomal degradation of ornithine decarboxylase is regulated by NQO1. Asher G1, Bercovich Z, Tsvetkov P, Shaul Y, Kahana C.
People are still finding copy-pasted sections in the blots of Rony Seger’s cellphone / ERK study. Crops up with Ronen Alon sometimes. Cancer Res. 2004 Nov 15;64(22):8318-27. 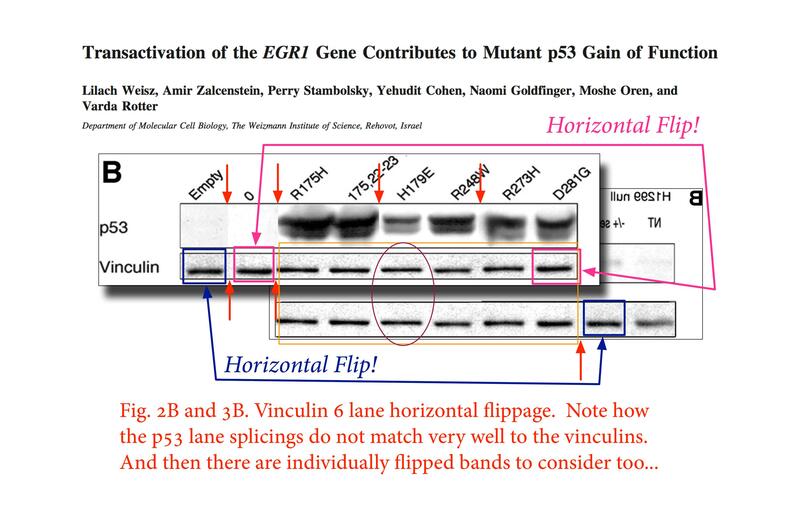 Transactivation of the EGR1 gene contributes to mutant p53 gain of function. Weisz L1, Zalcenstein A, Stambolsky P, Cohen Y, Goldfinger N, Oren M, Rotter V.